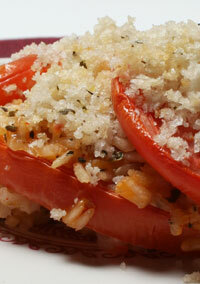 The summer tomato-rice casserole is a great dish. Of course it is good any time but it is really, really good when you can get fresh summer tomatoes - hence the name! Summer tomatoes - fresh, summer tomatoes - are so tasty, sweet and juicy! Greenhouse tomatoes will do in a pinch - they serve their purpose after all, but fresh summer tomatoes are best for this deliciously simple casserole. there should be 2 1/2 cups cooked rice. pepper and half the salt. tender, and casserole is bubbly under the topping. Let casserole sit for 20 minutes, or serve lukewarm. dietary fiber, 460 mg sodium.